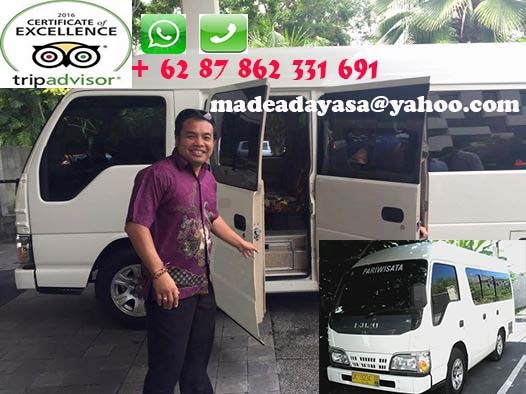 Bali Hotel Transfer offer a great sightseeing package along the way to your new hotel place . Bali island is a big province and divided by 8 regions . Each region have a different tourists area to explore . Each city has a different characteristic , different sightseeing , different way of living in one same cover which is Hindu Bali concept of living . To stay in a different places during your holiday will give you best opportunity explore the real Bali . Therefore we would like to offer our transfer service including best sightseeing plan along the way to the Hotel . There are few interesting tourists site to stay around Bali such as Candi Dasa , Ubud , Amed , Tulamben , Pemuteran and Medewi Beach . Elephant cave Temple , Bali Kanto Lampo Waterfall , Coffee farm for coffee Luwak testing , some art villages . Amed and Tulamben is located in the eastern part of Bali . The small fishing village who has turn become another important tourist village in the east . The beauty of the calm beach , coral reef view and crystal clear sea water make this place a perfect place for snorkeling and diving activities . The area which is away from hustle and bustle tourism . Please note that we are an open schedule tour that you may design your own plan as you like . Beautiful quite tourists village in the west part of Bali . Approximately 3 – 4 hours drive from Kuta district , the center of tourism city in Bali . A nice tranquil tourists site behind the west mountain . For most tourist come here just for relaxes , swimming , snorkeling and diving activities . Don’t wish to find a beach pub , night club or bussy bar here . Even far and long drive to get here but driving here is a such beautiful drive . Cut through the mountain through the lakes , hills and rice terrace landscape . Its guarantee a beautiful long drive . Here we offer some sightseeing sites along the trip to Pemuteran .